What is Hell? From a Jewish point of view, Hell is a place where all the rationalizations, all the lies we tell ourselves to justify our misdeeds, disappear. It’s OK that I stole, since I need the money a lot more than him. It’s OK that I yelled at my coworker, because I really needed to get that anger off my chest. It’s OK that I abused my son, since I’m under so much stress with all of these kids and he was provoking me. And when those rationalizations disappears…After death, that’s Hell. But during life, that is the beginning of true teshuva. 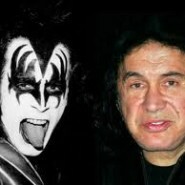 Gene Simmons, the lead singer of the heavy metal group, Kiss was born in Israel, and moved to New York with his mother at the age of 9. As a child, he was a student at Yeshivas Torah v’Daas. In adulthood, Simmons cut off contact with his father, who had remained in Israel and fathered triplet daughters and a son (who appear in this video, with their children). In this emotional video, we see Simmons during his 2011 visit to Israel which he described as a “life-changing experience,” visiting his half-siblings and his father’s grave for the first time. How moving to witness a person throwing away his rationalizations and doing teshuva for hurting and abandoning his father. Why Did the Old Man Give Me His Seat on the Light Rail? What an arrogant jerk. This was so staged and phoney- just like him. Where is the teshuva to which you suggest? it looked real to me. He looked genuinely upset that he had been so stubborn and cut off ties his father. What do you other JewishMOMs think? Tsshuva isn’t usually staged for the cameras. It’s not for me to judge, but something so personal should be kept between him and Hashem. Too bad he didn’t realize that. It is common for children to resent a parent’s remarriage out of loyalty to the other parent. We don’t know the whole dynamics of what happened between them over the years as he became famous. This article is written in such a slanted manner, without benefit of any research or understanding of the facts. A 9 year old child does not abandon his father! It is the parent’s job to ensure contact and support of a child. Gene, as an adult, graciously takes responsibility for his role in the relationship. But the amount of judgement I am reading here is fairly disgusting – and it starts with the original blog post. For shame. If he is jewish, we should not name call, but hope that there is a piece of him yearning to reveal his neshama. Getting close to Elul, we can just use this video, whether he is sincere or not, to be sure our own personal teshuva is genuine. Gene Simmons does all these performances for self publicity. money and fame. Better to keep your soul and lose the world.